Teachers play an unusually prominent role in Scottish fiction. Jean Brodie is, of course, the archetype, but many other novels feature a ‘dominie’ as a central character. This is perhaps partly the natural consequence of so many Scottish writers being teachers, including Robin Jenkins. He began his teaching career in Glasgow’s east end in the 1950s, a setting not unlike that of The Changeling, which remains his best known novel after The Cone Gatherers. The plot of The Changeling has dated somewhat, though the issues it raises have not. Charlie Forbes decides to take a promising pupil from a poor background, Tom Curdie, on holiday with his family. Nowadays they would find themselves the subject of a nationwide manhunt, but in those more trusting times we have to take Jenkins word for it that this, while unlikely, was not impossible. (Curdie’s family do appear at the end in an attempt to blackmail Forbes with hints of paedophilia, but only to demonstrate their own baseness). Is it ever possible, Jenkins questions, to commit a selfless act? Just as we can never quite pin down Forbes – well-meaning innocent or destructive meddler? – so too our impression of Tom is changeable. At one point he wants revenge on Forbes for his pity – “It would pay Forbes back.” When he breaks into the school he is careful to steal from Forbes’ classroom – if he didn’t it “would be like admitting he was grateful.” However, we also see his kindness to his younger brother. And how should we feel when on holiday he shoplifts despite having been given money to buy – is he simply reminding himself of who he is? The scene demonstrates the moral complexities of the novel: Forbes wants to do right but cannot whole-heartedly (in merely hurting the rabbit he makes things worse); Tom does right but is suspect for his lack of emotional response. Slowly, painfully, the time away begins to change Tom – at one point he calls himself ‘Tom Forbes’ – but, as Jenkins realises , the problem with holidays is that you eventually have to go home. Is it fair to give Tom a glimpse of happiness and then take it away? The novel ends, like The Cone Gatherers, rather melodramatically, but that doesn’t detract from the fact that the questions it asks are as relevant today as ever. Probably every country has a writer admired within its borders but little known outside. Often this is because, whatever their talent, their concerns appear, at least superficially, localised. Robin Jenkins certainly has a strong claim to be Scotland’s entry in this particular category. Despite being loved and respected by a wide range of readers within the country, he has almost no profile outside Scotland, and those of his novels in print tend to be published by Scottish imprints. Most of his novels are set in his homeland, and those set abroad invariably feature a Scottish protagonist, but this is true of most novelists. It is Jenkins’ focus on religion, and its often peculiar Scottish off-shoots, which has most likely prevented him reaching a wider audience. This is a shame as Jenkins is not only concerned with faith, but with morality, and, in particular, what makes a good man or woman (it’s no accident that one novel is titled A Would-Be Saint). Though his narrative style can often seem blunt, Jenkins’ characters are complex, and Agnes is also presented to us as an excellent teacher who brings happiness to her pupils and is admired by her headmistress. Other characters are as confused in their reaction to Agnes as the reader, not knowing whether to pity her, be irritated by her “smug holy smile”, or admire her unbreakable faith. Between Ann and Agnes, Jenkins places a number of other religious characters, including their fathers. Ann’s father is a Church of Scotland minister, conservative and compromised in his beliefs. He will not speak against the base but also rejects the best bedroom in the manse as it has a view of it. Agnes’ father has founded his own church, but this brings him no happiness and prevents his wife from seeking the medical attention she needs. Of course they live in a society where religion is still important, more important than it probably was in most of Scotland even in 1972 when the novel was published. However, though superficially dated, what Jenkins is expert at presenting is the complexity of moral choices. This, and not the weapons of mass destruction, seems to be Jenkins true test of humanity, and one that the village fails. Cleverly, it is not that no-one wants to help Tommy; it is simply that he is allowed to be forgotten. 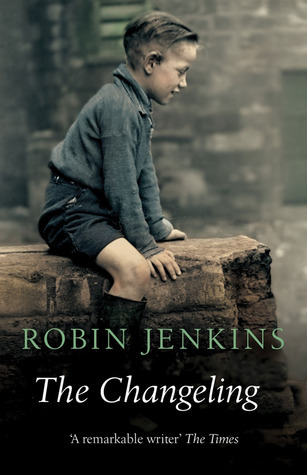 In tackling such basic human issues related to what we belief and how this makes us act, Jenkins is a writer who should not be forgotten. You are currently browsing the archives for the Robin Jenkins category.